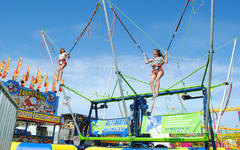 Fly like a bird, the Bungee Trampoline will be the hit at your next festival or event! Jump up to 25' in the air and do flips SAFELY! With up to 4 riders at a time, everyone is sure to get a turn on this. The Bungee Trampoline is always the most popular ride at any event we ever do.